This overview takes a brief look at trends within various parts of the crime control industry. It's a fair assumption that barring outside action, what happens tomorrow will resemble what happened yesterday. But with so many factors at play in the crime control industry, we should look at what influences the health of the industry in order to assess likely industry scenarios in the future. Each section provides a short summary of the numerical trends, and then lists some factors that will determine what happens in the next two to five years. Many of these factors are directly or indirectly political, and therefore ripe for being influenced by advocacy efforts. A large portion of the prison increase since 1990 has been from a decrease in prisoners being paroled and an increase in the frequency with which parolees are returned to prison for technical violations of parole terms without the commission of new crimes. Changes in sentencing laws requiring longer sentences have also played a major part. Political decisions like these outweigh the small changes in the crime rate from year to year. The September 11th attacks and the War on Terrorism have created a more punitive atmosphere towards immigrants. Detention of immigrants which is not tracked as incarceration was on the rise even before September 11. Empty cells from overbuilt jails and prisons could be filled by contracts with the INS as some states make policy changes (e.g. drug law reform) that reduce local prison and jail populations. The federal government's war on drugs does not appear to be restrained by the economic crisis facing the states. The economic crisis is forcing states to reexamine the expensive policy of using mass incarceration as a response to crime. The "War on Terrorism" may divert funds from the "War on Drugs". 2 Bureau of Justice Statistics, Prisoners and Jail Inmates at Mid-year 2001, 5/10/02 revised edition, Table 1. 3 Bureau of Justice Statistics, Prisoners and Jail Inmates at Mid-year 2001, 5/10/02 revised edition,p. 2. 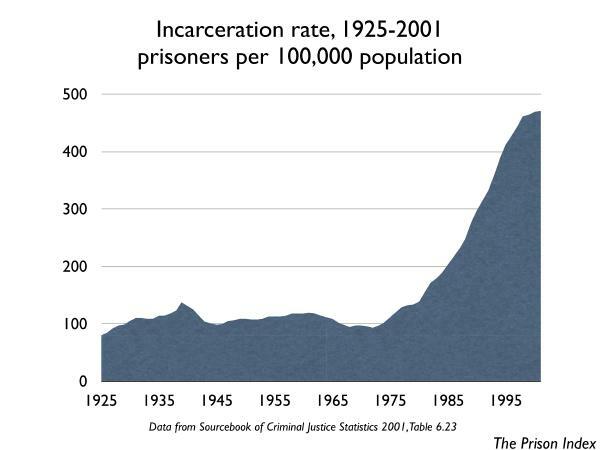 4 Bureau of Justice Statistics, Prisoners 2001, Table 4. 5 Calculations based on Bureau of Justice Statistics, Prisoners and Jail Inmates at Mid-year 2001, 5/10/02 revised edition, Table 2. 6 Blumstein and Wallman ed, The Crime Drop in America (2000), p. 11. 7 Bureau of Prisons, Quick Facts, May 2002, viewed January 4, 2003, http://www.bop.gov/fact0598.html. 8 Bureau of Justice Statistics, Prisoners 2001, p. 12, 14. 9 3993 per 100,000 civil labor force. Nils Christie, Crime Control as Industry, 2000 ed, p 141. 10 Calculations based on Bureau of Justice Statistics, Prisoners and Jail Inmates at Mid-year 2001, 5/10/02 revised edition, Table 15.